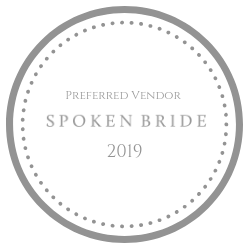 I was super excited to find out recently that I’ve been accepted as an official Spoken Bride preferred vendor for 2019. Spoken Bride is a resource for Catholic couples in planning their wedding and better understanding the beauty of marriage. I was thrilled to be accepted as part of their vendor community, connecting with other Catholic wedding vendors and being recommended by Spoken Bride to their inquiring brides. In light of this news, I thought it would be fun to share a bit of my own perspective on why I, as a practicing Catholic, love being a wedding photographer! 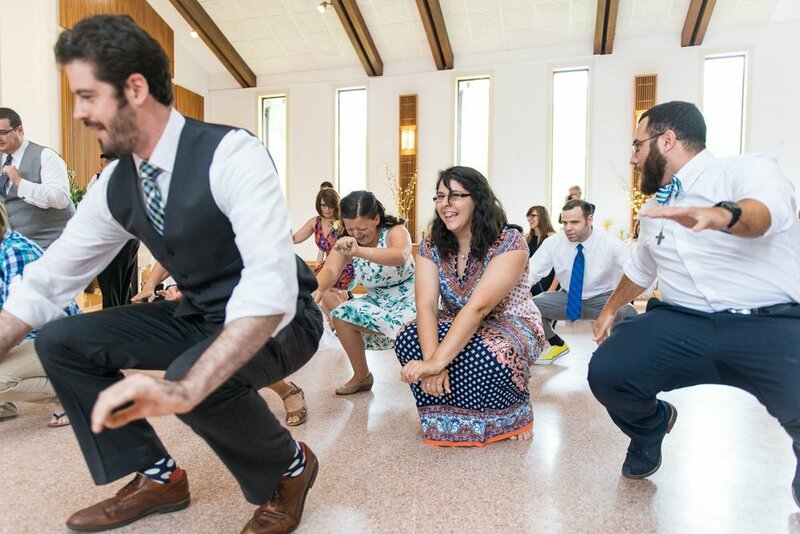 Catholics just really love weddings. Like, a lot. I can’t tell you how many photographers I’ve come across, both in online photography communities and in my own wedding photographer search, who only seem to care about getting prize-winning shots and building up their portfolio with portraits. Take a look yourself - find a few wedding photographers and see how many of the photos they share are from the actual wedding ceremony. Not many, right? It’s nuts to me as a Catholic wedding photographer that there are photographers out there whose eyes glaze over during the ceremony, who whisper in the back of the chapel during unique moments of the ceremony to their assistant, who just throw in one, maybe two photos of the people who do the readings or sit at the front row or assisted with some part of the ceremony. As someone who appreciates the fact that this day is centered on the ceremony, because of my belief that these two people are standing before each other and before God (whether they recognize that or not) promising commitment and fidelity to each other for the rest of their earthly lives, I love this part of the day. 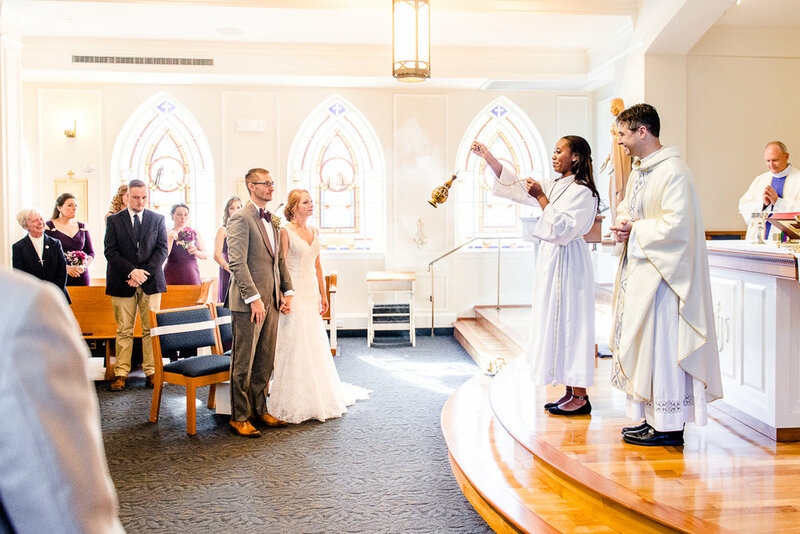 Whether it’s 10 minutes or 90 minutes, in a beautiful cathedral or a dimly-lit chapel or your new home’s front porch, the fact is that everything else that day is centered around this ceremony, and it’s the part you’re going to want someone to appreciate if you’re getting married for the right reasons. In addition to being able to participate in the wedding ceremony, I love being able to celebrate with the couple throughout the day, riding that emotional roller coaster with them. As the photographer, I’m often the person who spends more time with the couple than anyone else, and especially the bride! From the moment she starts getting ready, to the individual bridal/groom portraits where we get some alone time to take a moment away from the social hustle and focus on the beauty of the person getting ready to be married, to the ceremony, to the family portraits with joy afterward, and then the party with all its little moments of fun and love… I get to be there, following the bride and groom around, capturing the smiles and the tears and the moments that they’ll be glad they get to remember forever because I can give them photographs that jog their memories. And through it all, I get to pray for and with the couple and the family. I always say a prayer for the bride and groom the night before the wedding; I take a moment to pray for them if they choose to do a “first touch” prayer before the ceremony; I pray with them through their ceremony (especially in a Catholic mass or Christian ceremony where I can actively participate in the prayers as I work). It’s a privilege to witness the entire day with the bride and groom and be there with them and for them throughout. We Catholics firmly assert that since Jesus’ first miracle was at a wedding, turning water to wine, we’re meant to celebrate accordingly! Catholics like a good party. I love getting to laugh along at the reception, following the bride and groom around as they greet tables, dancing along with guests as I snap their snazzy dance floor moves (especially when Whitney Houston’s “I Wanna Dance With Somebody” comes on!). I’ll even grab a glass of wine or a featured cocktail if the bride & groom are cool with it, and just enjoy the party as I work, snapping fun moments and group photos to document the evening. While I certainly wouldn’t say I get to have as much fun as a guests because I’m constantly watching the bride and groom and looking out for the action (and because I can’t have more than MAYBE one drink! Ha!) I do get to laugh along with people, cheer as the bride and groom stuff each other’s faces with cake, and maybe shed a tear or two during a moving toast. I get to serve couples in their wedding prep, wedding day, and wedding memories. I love working with people in general, and it’s a great privilege to be in this field specifically when it’s about something as meaningful and important as a wedding. I’m not just celebrating with the couple as a participant - I’m afforded the opportunity to serve the couple through my work. That also means recognizing that it isn’t about me and my portfolio - it’s about the couple. I think part of why I’m drawn to this field of work is being able to help couples with one of the most important parts of their wedding - the photos to remind them of one of the most important days of their lives. And I absolutely love helping couples with other aspects of their wedding prep when I can! One of my favorite things about my job is getting to help with the timeline of the day, give advice on whether to do a “first look” or not, give guidance on the logistics of traveling from place to place throughout the day. I’m not just here to snap pretty photos and share them with my friends and family; I’m here so that the bride and groom can share their photos with long-distance relatives, enjoy images in their new home together that reflect the love they share as evidenced from their wedding portraits, and remember their wedding day in the years to come as even the vivid memories of the day begin to fade.